This Adventure School Trip gives students an ultimate taste of Southern Africa as it takes them through three countries within 15 days. Starting in Namibia they will travel through Botswana and end in Zimbabwe. It is exciting to see how three neighbouring countries exhibit such unique cultures, landscapes and climate. The Namib is the world’s oldest desert, and although it stretches along the entire length of Namibia’s coastline, the Namib commonly refers to the vast sea of sand from Luderitz to Swakopmund. For a big sandy desert the scenery is remarkably varied, with the giant red dunes of Sossusvlei being the most famous part. Because of how old it is the Namib is home to numerous species that don’t occur elsewhere and although no humans live in the desert, an amazing array of flora and fauna manages to survive here. In Botswana, lying in the middle of the largest expanse of sand on earth, the Okavango Delta is one of Africa’s most amazing, sensitive and complex environments supporting a spectacle of wilderness and wildlife. Unique as one of the world’s few inland deltas, the placid waters and lush indigenous forests offer a safe haven for innumerable bird and wildlife species. One of the original natural wonders of the world, the Victoria Falls is breathtaking and not surprisingly a World Heritage Site. Known locally as The Smoke that Thunders, this spectacle is accessible from both Zambia and Zimbabwe. Unlike other waterfalls Victoria Falls has a natural catwalk across from the falls which provides for spectacular viewing. Arriving in Windhoek, Namibia, the group travels to Spitzkoppe and camps there for the first night. The next day ends with a hearty meal and a cosy bed at the Hotel Gruener Kranz in Swakopmund. The forth day is one for visiting Damaraland and the Otjitotongwe Cheetah Farm before moving on to Etosha National Park. After crossing the border, students will visit the well known Okavango Delta, Caprivi Strip and Chobe in Botswana. The last days will be spent at the majestic Victoria Falls in Zimbabwe, before flying back home. 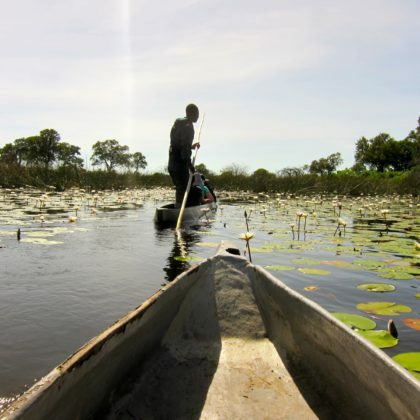 The Mokoro is a traditional canoe-like vessel commonly used in the Okavango Delta as a popular mode of transport. On this safari, mokoros provide the opportunity for you to glide quietly between the various waterways while viewing the spectacular wildlife and surroundings of the Delta.